When the WTO’s eleventh Ministerial Conference meets in December 2017, Members can make a significant contribution to the 2030 Agenda by calling for new rules to curb fossil fuel subsidies. Fossil fuel subsidy reform could significantly reduce global greenhouse gas emissions and free billions in public funds that could be reallocated to other development priorities. WTO Members have several options to address fossil fuel subsidies, including: providing technical assistance and capacity building; improving transparency; making reform pledges; adopting a political declaration; and including fossil fuel subsidies in the WTO’s list of prohibited subsidies. With 2017 rapidly drawing to a close, several international summits this year can still significantly advance sustainable development. Hopeful observers will naturally look closely at any progress made at the 23rd UN Climate Conference in Bonn in November, as well as the upcoming UN Environment Assembly in Nairobi in December. Yet another key summit is likely to receive much less attention in the climate change and sustainable development communities: the World Trade Organization’s (WTO) eleventh Ministerial Conference (MC 11). When meeting in Buenos Aires this December, WTO Members can leave a real mark on the goals of the 2030 Agenda for Sustainable Development and the Paris Agreement by calling for new WTO rules to curb government support to fossil fuels. The benefits of fossil fuel subsidy reform are undeniable. It is a vital piece of the climate change puzzle, estimated to cut greenhouse gas emissions by some 11% by 2020 if implemented in 20 countries. But it can also positively impact other SDGs. Removing the billions of dollars put into fossil fuel consumption and production each year can relieve the burden on the public purse, allowing for the re-channeling of funds to other development priorities, such as health, education and public infrastructure. Moreover, removal of fossil fuel subsidies can help level the playing field, given that subsidies are known to affect the rate and timing of development of new fields or mines. But while international forums such as the G 20, Asia Pacific Economic Cooperation (APEC), the Organisation for Economic Co-operation and Development (OECD) and the International Monetary Fund (IMF) have begun to take up fossil fuel subsidies, their lack of consideration at the WTO thus far has been conspicuous. Though cases related to more than 10 renewable energy support measures have been filed under the WTO dispute settlement mechanism over the past decade, not one fossil fuel subsidy has been challenged. With momentum building for the international trade community to engage with this critical sustainable development issue, MC 11 offers a clear opportunity to change course. Skeptics may interject: “Why should the WTO get involved when fossil fuel subsidies are already addressed elsewhere?” While other international organizations have put fossil fuels subsidies on their agendas, the persistence of such subsidies worldwide shows that more still needs to be done. The WTO would not be the only organization addressing the issue, and would need to act in concert with others. In fact, owing to its wide membership, history of promoting subsidy reform in other sectors, and well-established dispute settlement system, the WTO is one of the most suitable international forums for doing so. The Organization was explicitly established to ensure that economic progress is achieved in accordance with sustainable development. Moreover, the 2030 Agenda recognizes trade as an enabler for achieving the SDGs. SDG 12 (Responsible consumption and production) specifically addresses fossil fuel subsidies. Precedent for such engagement already exists, as the WTO continues to consider the topic of environmentally harmful subsidies in the fisheries sector – with hopes that rules in this area will be agreed upon at MC 11. In a recent policy brief, we show that WTO Members can address this gap in several ways. 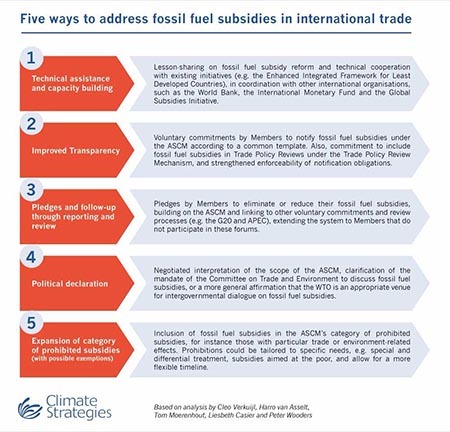 One approach would be for WTO Members to extend the list of prohibited subsidies of the Organization’s Agreement on Subsidies and Countervailing Measures (ASCM) to include certain types of fossil fuel subsidies, for instance those with particularly adverse climate change or trade impacts. A “softer” approach that might be more feasible in the short-term would see Members voluntarily pledge to reduce their fossil fuel subsidies, extending existing commitments and processes under the G20 and APEC. Progress could be tracked through regular reporting and review. However, not all options need to come in the form of new rules or commitments. Members could begin by offering technical guidance and capacity-building support on how to reform fossil fuel subsidies. Given existing shortfalls in the Organization’s subsidy notification system, governments could also agree to take steps to improve the transparency of fossil fuel subsidies. This option underlines a key role for any international organization in addressing fossil fuel subsidies: sharing information on the extent to which these subsidies are used. Concerns can be raised about the impacts of subsidy reform on energy prices and energy access for the poor. Although it should be noted that in many cases fossil fuel subsidies benefit the richer parts of society, it would be important for rules and guidance to factor in such development concerns, for example by including an exemption for subsidies that are proven to target the poor. The time is ripe for progressive countries to take the first small steps to help achieve a “win-win-win” situation for sustainable development, climate change and trade at the eleventh WTO Ministerial Conference in December 2017. Agreeing on the most suitable option – or combination of options – to pursue will take time. But at MC 11, a first important step would be for Members to signal their willingness to take up fossil fuel subsidy reform in the WTO’s work. This could be done, for instance, through a political declaration reaffirming the commitments made in the SDGs and the Paris Agreement, or recognizing the general need for new rules in this area. Importantly, this effort need not be taken up by all WTO Members simultaneously. A coalition of the willing could decide to lead the way. The time is ripe for progressive countries to take the first small steps to help achieve a “win-win-win” situation for sustainable development, climate change and trade at MC 11.